So Just How Dumb Were Jesus’ Disciples? The Resurrection, Part II. To hear Paul tell it, the resurrection isn’t just a big deal, it’s The Big Deal: “But if Christ has not been raised, then our preaching has no purpose and your faith is foolishness.” (1 Corinthians 15:14) Given the essential importance of Jesus’ resurrection, at the very least one would expect plenty of witnesses to the Most Important Miracle of all time—at least as many as witnessed the raising of Lazarus—as well as a coherent narrative of the events leading up to it. If you’re at all surprised to learn the New Testament includes neither, then obviously you haven’t been keeping up. First, there’s bad news and there’s even worse news. Let’s start with the worse news: according to the canonical gospels—Matthew, Mark, Luke, and John— no one actually sees Jesus rise from the dead. Cook on that for a minute. Despite repeated predictions that Jesus will rise from the dead after three days (Mark 8:31; 9:31; 10:32-34), not a single one of his apostles shows up to see it happen. Let’s hear that again just to be sure: No. One. Actually. Sees. Jesus. Leave. The. Tomb. If you think that’s already bad enough, brace yourself. 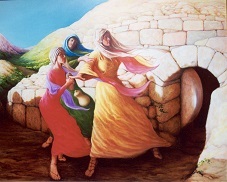 When some of the women who followed Jesus finally got around to visiting the tomb and discovered it empty, Mark, the earliest gospel, tells us “And they left the tomb running, for they were trembling and beside themselves, and they said nothing to anyone because they were afraid.” (Mark 16:8) And that’s how the first gospel account apparently left matters. For whatever reason, Mark chose to end his gospel this way, with no prior belief, stated or implied, that Jesus’ disciples would find he had risen from the dead. Now obviously Matthew, Luke, and John couldn’t let the story end that way but when they polished it up they just introduced more incoherence, contradiction and confusion. Let’s go back to the women who find the tomb empty. According to the canonical gospels—Matthew, Mark, Luke, and John— no one actually sees Jesus rise from the dead. First recall that Jesus taught “plainly,” “openly”—the word Mark uses is parrēsia, which means “unambiguously” (Mark 8:32)—that he would rise from the dead after three days and when Peter tries to tell him that’s nonsense, Jesus rebukes Peter in the strongest possible terms, the famous “Get behind me, Satan!” logion (Matthew 16:23). So how did the female disciples not get the memo about the three-day resurrection? When John retells the story, the women propose a natural—not a supernatural—reason why Jesus’ body is missing: “They’ve taken my Lord away and I don’t know where they’ve put him.” (John 20:13) So in short, the iconic “empty tomb,” angels notwithstanding, is not proof Jesus has risen from the dead; according to the gospels of Mark and John it is instead a source of fear and confusion. Much has been written about the women “witnessing” the resurrection, but according to the gospels the guys, who “have left everything” to follow Jesus (Mark 10:28), weren’t at all impressed. Indeed, the way Luke tells it, the remaining members of the Twelve Amigos were having none of it. In Luke’s account the women visit the tomb where two Men in White remind them of Jesus’ oft-repeated promise that he would rise from the dead. Here’s what follows: “After returning from the tomb they reported all these things to the Eleven and all the others. The women were Mary Magdalene, Joanna, and Mary, the mother of James, and the other women with them who told the apostles these things. But their words seemed like nonsense to them and they didn’t believe the women. However Peter stood up and ran to the tomb, and stooping down, he saw only the linen binding cloth, and he left, wondering to himself what had happened.” (Luke 24:9-12) Peter, predictably, is still as thick as two short planks. In the next installment we’ll have a look at some comically improbable elements in the gospel stories and after that we’ll see how the stories take a turn for the truly weird. For well over a century scholars who take the historical approach to the resurrection stories have pondered over their multiple contradictions, improbable scenarios, and inconcinnities. At this juncture, I propose you entertain an idea that might explain it: what if neither Jesus nor his disciples expected him to die? What if Jesus’ predictions of his death and resurrection are apologetic back formations designed to account for an unexpected event? Hold that thought. We’ll pursue that possibility in more depth a bit later. ExChristian.Net: So Just How Dumb Were Jesus’ Disciples? The Resurrection, Part II.